Beverage Dispenser - Get Seen and Drive Sales with Jetpacks! The Jetpack drink backpacks are designed to dispense cans or bottles, hot or cold drinks and carbonated or still. Each drinks dispenser is lightweight and can be branded for maximum effect, and if required Jetpacks’ staff can operate the equipment. All products are available to buy throughout the world and our beverage dispensers may also be hired in the UK. 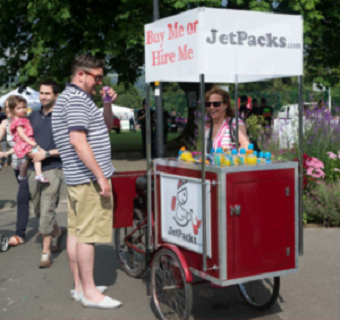 Jetpacks are delighted to announce the arrival of the Trike; perfect for use at promotions, weddings, children’s parties, anniversaries, charity and fund raising, christenings, corporate days, product launches, school fares, milestone birthdays, carnivals, festivals, fetes, fairs and much more. A huge variety of drinks can be stored in the Jetpacks Trike. The instructional video will take you through the process of using a Jetpack beverage dispenser step-by-step. From setting up the drinks dispenser to serving drinks and making adjustments for left and right handed operation.